Dec. 22, 2008: Prime Minister Stephen Harper names Mike Duffy to the Senate, along with Pamela Wallin, Patrick Brazeau and 16 others. June 5, 2011: Senate clarifies its travel policy and adds Appendix A to provide specific examples of the policy principles. June 13, 2012: Auditor General Michael Ferguson recommends the Senate require documentation for more of senators' expenses claims, after finding inadequate documentation in two of seven cases examined. December 2012: Questions are raised about how much time Conservative Sen. Mike Duffy spends at his declared primary residence in P.E.I., since he is claiming living expenses for staying in his longtime Ottawa-area home. Feb. 4, 2013: Reports emerge that Duffy applied for a P.E.I. health card in December 2012 and that he does not receive a resident tax credit for his home on the island. Feb. 8, 2013: Senate hires external auditing firm Deloitte to review residence claims of Duffy, fellow Conservative Patrick Brazeau and Liberal Mac Harb. Feb. 11, 2013: Duffy sends an email to Nigel Wright apparently containing advice from his lawyer. It outlines certain scenarios for repayment of the expenses and the "assurances" he would require. Feb. 13, 2013: The date Duffy says he meets Harper and Wright after a Conservative caucus meeting. 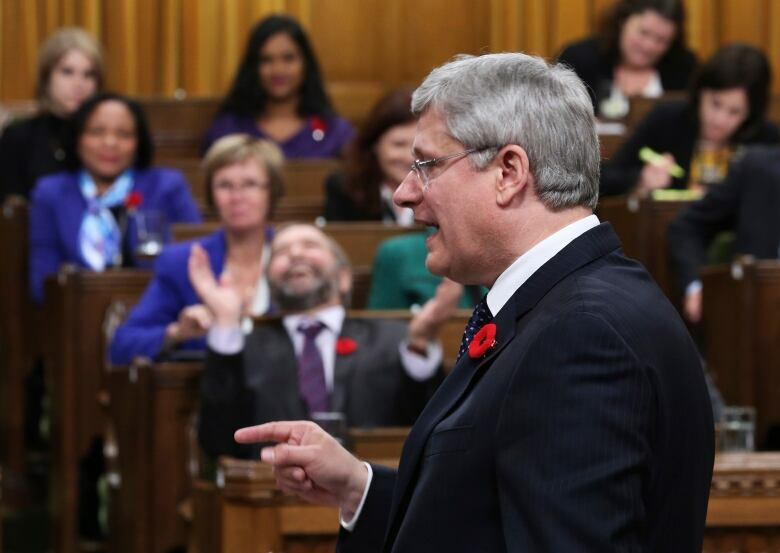 Harper tells Duffy he must repay questioned housing expenses. "The prime minister agreed I had not broken the rules but insisted I pay the money back, money I didn't owe, because the Senate's rules are, in his words, 'inexplicable to our base,'" Duffy says in an October 2013 speech in the Senate. Feb. 21, 2013: Duffy agrees to follow what he later describes as a PMO-drafted plan to cover up the source of a $90,000 payback to the Senate, including a story that he borrowed the money from RBC. "On Feb. 21, after all of the threats and intimidation, I reluctantly agreed to go along with this dirty scheme," he says in the speech. Feb. 22, 2013: Claiming confusion with the rules, Duffy pledges to pay back the expenses. "My wife and I discussed it and we decided that in order to turn the page to put all of this behind us, we are going to voluntarily pay back my living expenses related to the house we have in Ottawa,'' he told CBC P.E.I. at the time. Feb. 27, 2013:Harper says all senators meet the requirement that they live in the area they were appointed to represent. March 1, 2013: Marjory LeBreton, the Conservative leader in the Senate, tells CBC News that "Senator Duffy maintains a residence in P.E.I. and is qualified to sit in the Senate." Mar. 25, 2013: Wright sends a bank draft for $90,172.24 to the office of Duffy's lawyer. Mar. 26, 2013: $90,172.24 is transferred to Duffy's RBC bank account, and his cheque for $90,172.24 is delivered to the Senate. The cheque cleared Duffy's bank on March 28. May 8, 2013: A meeting between PMO and Conservative senators and staff occurs to discuss the altering of a committee report on Duffy's residency and expenses. Negative language is removed. May 9, 2013:Senate releases Deloitte audits of Duffy, Harb and Brazeau, as well as the Senate committee reports. Harb and Brazeau are ordered to repay $51,000 and $48,000 respectively. The report on Duffy is shorter and does not include the same language suggesting he should have known the difference between primary and secondary residences. Government Senate Leader Marjory LeBreton says the Senate now considers the Duffy matter closed. May 12, 2013:RCMP says it will examine Senate expense claims. May 15, 2013: The Prime Minister's Office confirms that Wright personally footed the bill for Duffy's housing expenses because Duffy couldn't make a timely payment. 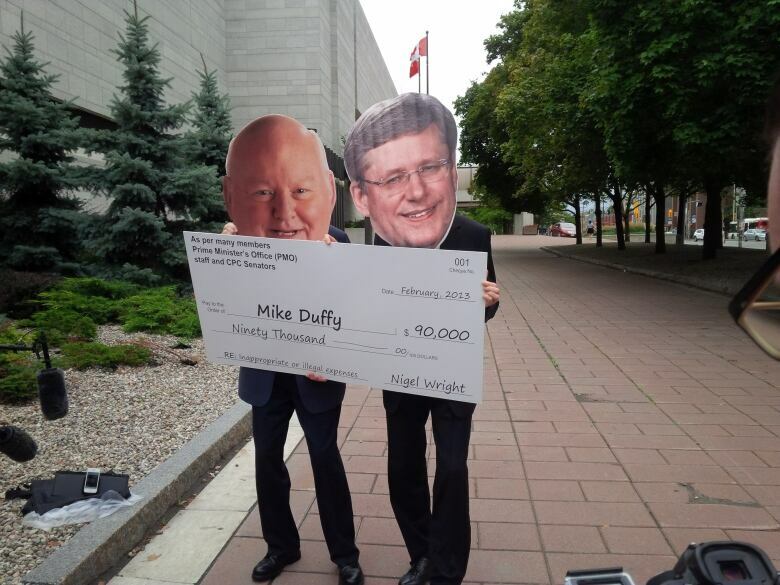 May 16, 2013: The Canadian Press reports that Duffy submitted travel expense claims to the Senate on the same days that he was campaigning for Conservative candidates in 2011 and claiming expenses from them. He resigns from the Conservative caucus later that day. May 17, 2013: Senator Pamela Wallin also announces she's leaving the Conservative caucus. Her travel expenses, which totalled more than $321,000 since September 2010, have been the subject of an external audit since December. May 19, 2013:Wright announces his resignation as Harper's chief of staff, a move Harper says he accepts with "great regret." Wright is replaced in the chief of staff's role by Ray Novak, who has been by Harper's side since 2001. In October, Harper says Wright was "dismissed." May 22, 2013: Harper tells reporters during a trip to Peru he did not know about, nor was he asked to sign off on, the Wright cheque, adding he would not have allowed it had he known. May 28, 2013: Senate internal economy committee holds a public meeting to review Duffy's expenses associated with travel. Senate finance officials say they've detected a pattern that concerns them. The committee votes to send the matter to the RCMP. May 28, 2013: In his first appearance in the House since Wright's resignation, Harper tells MPs, "The facts are simple and they are clear. It was the belief of Mr. Wright — in fact, I think it is fair to say the belief of all of us — that Mr. Duffy should repay any inappropriate expenses. Mr. Wright ultimately decided, on his own, using his own resources, to assist Mr. Duffy in that repayment, a matter he kept to himself until Wednesday, May 15." May 30, 2013: CBC News reports on emails that reveal Duffy was in consultations with Conservatives about an expanded role in the party and increased compensation, including a suggestion he be made a minister. June 3, 2013: LeBreton, the Conservative leader in the Senate, says she intends to ask the auditor general to look into all the expenses of the upper chamber. June 6, 2013: Conservative and Liberal senators agree to invite the auditor general to scrutinize the way they spend taxpayers' money. The same day, Harper tells the Commons that Wright paid the $90,000 with his own money: "Mr. Wright wrote a cheque on his own personal account and gave it to Mr. Duffy so he could repay his expenses. He told me about it on May 15. He obviously regrets that action. He has said it was an error in judgment and he will face the consequences as a consequence." June 13, 2013: The RCMP confirms it has launched a formal investigation into Wright's involvement in the expense scandal. Brazeau and Harb are given 30 days to reimburse taxpayers for their disallowed living expenses — bills that together total more than $280,000. July 4, 2013: Media reports say RCMP investigators allege that the Conservative party had planned to repay Duffy's improperly claimed living expenses, but balked when the bill turned out nearly three times higher than expected. July 5, 2013: Harper is accused by the opposition of misleading Canadians after repeatedly insisting Wright acted on his own when he gave Duffy $90,000 to reimburse his invalid expense claims. The RCMP says in a court document that Wright told three other senior people in the PMO about the transaction. July 17, 2013: Harper's office says it has not been asked by the RCMP for an email at the heart of its criminal investigation into the Senate expenses scandal. The PMO denies withholding the email, which apparently summarizes the deal struck between Duffy and Wright to pay off invalid expense claims. Aug. 26, 2013:Harb resigns from the upper chamber. Harb, who earlier left the Liberal party to sit as an Independent, drops a lawsuit and pledges to repay his questioned living and expense claims. Oct. 8, 2013: RCMP alleges Duffy awarded $65,000 in Senate contracts to Gerald Donohue, a friend and former TV technician, who did little actual work for the money. Oct. 17, 2013: Claude Carignan, the government's new leader in the Senate, introduces motions to suspend Duffy, Wallin and Brazeau from the Senate. The motions call for the three to be stripped of their pay, benefits and Senate resources. Oct. 21, 2013: Duffy's lawyer, Donald Bayne, alleges Harper's staff and key Conservative senators were behind a scheme to have Duffy take the fall for wrongdoing that they agreed he had not committed. Oct. 22, 2013: In his explosive speech in the Senate chamber, Duffy accuses Harper's office of orchestrating a ''monstrous fraud'' aimed at snuffing out controversy over his expenses. Duffy accuses the prime minister of being more interested in appeasing his Conservative base than the truth. Oct. 28, 2013:Duffy delivers another speech, this time saying the Conservative party made arrangements to cover his $13,560 legal bill. "The PMO — listen to this — had the Conservative party's lawyer, Arthur Hamilton, pay my legal fees," Duffy says. He also casts doubt on whether Wright actually paid the $90,000: "I have never seen a cheque from Nigel Wright." Nov. 4, 2013:CBC News reports that a Nov. 1 letter from the RCMP superintendent in charge of the investigation reveals that investigators want copies of emails and documents mentioned by Duffy, including emails from the PMO related to a "script" for Duffy to follow in publicly explaining how he financed repaying the expenses. The documents "may potentially be evidence of criminal wrongdoing by others," the letter reads. Nov. 5, 2013: Senators finally vote to suspend Brazeau, Duffy and Wallin without pay — but with health, dental and life insurance benefits intact — for the remainder of the parliamentary session. Jan. 29, 2014: Liberal leader Justin Trudeau expels the 32 Liberal senators from his caucus in what he calls an effort to reduce partisanship in the upper chamber. He says if he becomes prime minister he would appoint only independent senators, chosen through an open public process. April 15, 2014: RCMP inform Nigel Wright he will not face criminal charges. July 17, 2014:Duffy is charged with 31 counts, including fraud, breach of trust and bribery. March 25, 2015: Ontario Court Judge Charles Vaillancourt named as presiding judge. April 7, 2015: The trial begins with Duffy formally pleading not guilty to all charges. Deputy Crown attorney Mark Holmes says Duffy billed the Senate for thousands in "secondary residence" expenses though he did not live in Prince Edward Island and was just "commuting" from his Ottawa home. Holmes also says Duffy claimed travel payments for Senate business when he was attending family events. Defence lawyer Donald Bayne says Duffy operated within the often-fuzzy Senate rules. April 8, 2015: On Day 2 of the trial, the Crown called former Senate law clerk Mark Audcent and began what became a protracted exploration of Senate rules and practices. April 15, 2015: Witnesses testify they received payments for various services from Duffy through cheques issued by Maple Ridge Media, a company run by Duffy's friend Donohue. April 22, 2015:Court is told that after his appointment to the Senate, Duffy moved quickly to declare a P.E.I. cottage as his primary residence, allowing him to claim more than $80,000 in housing expenses over the years. May 7, 2015: Three Conservative MPs testify they recruited Duffy to speak at fundraising events in their ridings because his star power would help "rally the troops." June 9, 2015: Duffy's former executive assistant testifies it was common practice in his office to have him sign blank travel expense claims in order to facilitate paperwork. 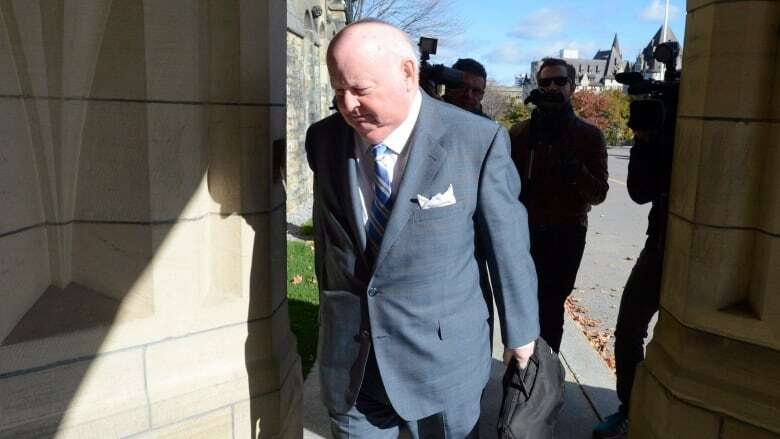 June 16, 2015: A forensic accountant testifies that Duffy was withdrawing more money from his bank account than was deposited, with the difference made up from a line of credit. June 18, 2015: The forensic accountant tracks the $90,000 Wright payment from an American account to a Canadian account, to an Ottawa law firm to Duffy's bank account. The Receiver General of Canada then received $90,172.24 from Duffy. Aug. 2, 2015: With the dissolution of Parliament for the Oct. 19 election, Duffy's Senate suspension is no longer in force. Aug. 12, 2015: Trial resumes, with former PMO chief of staff Nigel Wright's much-anticipated testimony. View an interactive who's who in the Duffy trial from The Canadian Press.